Musher Jocelyn Bradbury's team of sled dogs race past the Laconia Country Club in Laconia, N.H., during the final day of racing at the 86th Laconia World Championship Dog Sled Derby on Feb. 15, 2015. Frances “Mimi” Pickett rests at her home in Durham on January 17, 2014. Mimi, 89, has aplastic anemia, a blood disorder in which the body’s bone marrow doesn’t make enough new blood cells. Schuyler Benoit, left, comforts fellow graduate Darren Boles while De'mon Bivins, right, gives a thumbs up to his parents in the crowd before the start of Woodstock Union High School's graduation ceremony in Woodstock, Vt., on Friday, June 12, 2015. Hanover's girls varsity boat struggles to keep pace with Tabor Academy during the 1500-meter race down the Connecticut River in Hanover, N.H., on May 16, 2015. Hartford firefighter Zach Bowley, left, and Fairlee firefighter Geoffrey Mallett watch as firefighters from across the Upper Valley fight to put out a four-alarm fire at Britton Lumber Co in Fairlee, Vt., on Saturday, March 28, 2015. Gavin Benner, 9, screams during a meltdown at his school in Durham, N.C., on November 21, 2013. Gavin has autism, a developmental disorder that affects the neurological development of social and communication skills. When Gavin gets frustrated and struggles to communicate, he screams. Usually the screams will subside after a minute, but these screams lasted over 10 minutes. The teachers removed him from the classroom and waited until he calmed down. Kim Taylor from Zebulon anxiously watches the United States compete against Germany in the World Cup at a watch party at WakeMed Soccer Park Thursday, June 26, 2014, in Cary, N.C. The United States lost 1-0. Counselors at Camp Billings practice the front crawl approach during lifeguard training on Lake Fairlee in Thetford, Vt., on June 22, 2015. Twelve counselors were taking the Red Cross lifeguard certification course this summer. Billy Lyons, 11, of Hanover, N.H., competes in the pie-eating competition on the Dartmouth green in Hanover, N.H., on Saturday, July 4, 2015. Billy's older brother Tom, 12, won this year's ages 12 and under competition. 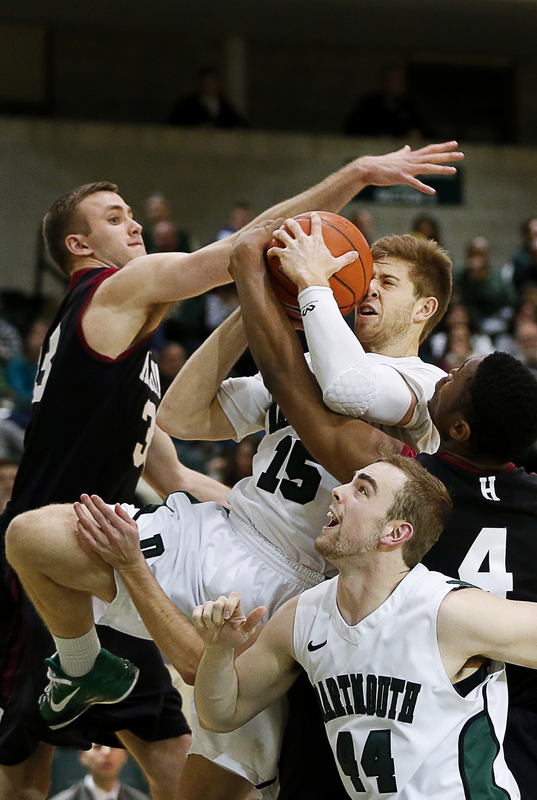 Dartmouth's Kevin Crescenzi, center, struggles to make a layup while Harvard's Evan Cummins, left, defends during the game in Hanover, N.H., on Jan. 10, 2015. Harvard won 57-46. Sophie Kluesner of Ferdinand, 9, did a handstand while playing with friends at Septemberfest at Dubois Community Park in Dubois, Ind., on Sept. 2.